Bank On Hampton Roads: Get On Board Your Journey to Financial Freedom! Get On Board Your Journey to Financial Freedom! 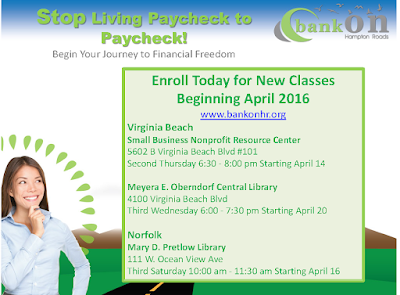 Brand new classes are forming for Bank On Hampton Roads. This is your opportunity to get a free financial makeover and get your finances back on track so that you can arrive at your financial freedom destination! Check out our calendar of classes and enroll today!